Significant cervical spine injury is very unlikely in a case of trauma if the patient has normal mental status (including no drug or alcohol use) and no neck pain, no tenderness on neck palpation, no neurologic signs or symptoms referable to the neck (such as numbness or weakness in the extremities), no other distracting injury and no history of loss of consciousness. Views required to radiographically exclude a cervical spine fracture include a posteroanterior view, a lateral view and an odontoid view. 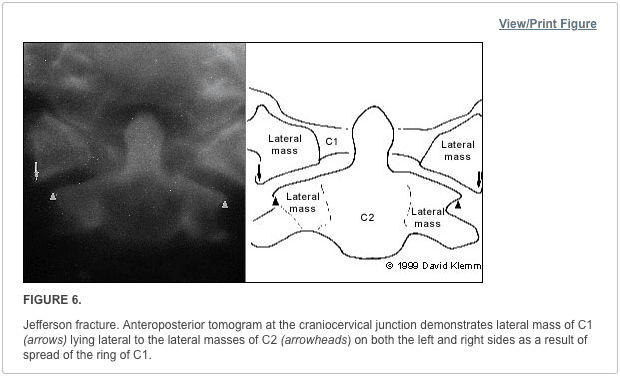 The lateral view must include all seven cervical vertebrae as well as the C7-T1 interspace, allowing visualization of the alignment of C7 and T1. The most common reason for a missed cervical spine injury is a cervical spine radiographic series that is technically inadequate. The “SCIWORA” syndrome (spinal cord injury without radiographic abnormality) is common in children. Once an injury to the spinal cord is diagnosed, methylprednisolone should be administered as soon as possible in an attempt to limit neurologic injury. 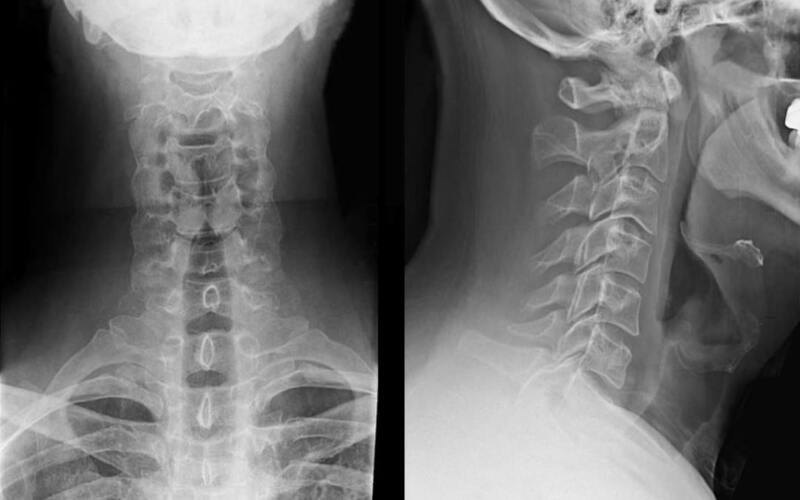 Radiographs continue to be used as a first-line imaging diagnostic assessment modality in the evaluation of patients with suspected cervical spine injuries. The aim of cervical spine radiographs is to confirm the presence of a health issue in the complex structures of the neck and define its extent, particularly with respect to instability. Multiple views may generally be necessary to provide optimal visualization. Although cervical spine radiographs are almost routine in many emergency departments, not all trauma patients with a significant injury must have radiographs, even if they arrive at the emergency department on a backboard and wearing a cervical collar. This article reviews the proper use of cervical spine radiographs in the trauma patient. 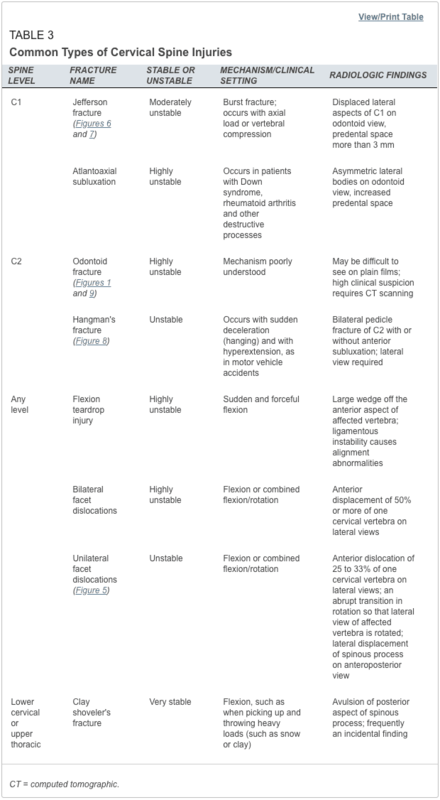 Low-risk criteria have been defined that can be used to exclude cervical spine fractures, based on the patient’s history and physical examination.1–6 Patients who meet these criteria (Table 1) do not require radiographs to rule out cervical fractures. However, the criteria apply only to adults and to patients without mental status changes, including drug or alcohol intoxication. Although studies suggest that these criteria may also be used in the management of verbal children,7–9 caution is in order, since the study series are small, and the ability of children to complain about pain or sensory changes is variable. An 18-year-old patient can give a more reliable history than a five-year-old child. Some concern has been expressed about case reports suggesting that “occult” cervical spine fractures will be missed if asymptomatic trauma patients do not undergo radiography of the cervical spine.10 On review, however, most of the reported cases did not meet the low-risk criteria in Table 1. Attention to these criteria can substantially reduce the use of cervical spine radiographs. In addition to the views listed above, some authors suggest adding two lateral oblique views.16,17 Others would obtain these views only if there is a question of a fracture on the other three films or if the films are inadequate because the cervicothoracic junction is not visualized.18 The decision to take oblique views is best made by the clinician and the radiologist who will be reviewing the films. Besides identifying fractures, plain radiographs can also be useful in identifying ligamentous injuries. These injuries frequently present as a malalignment of the cervical vertebrae on lateral views. Unfortunately, not all ligamentous injuries are obvious. If there is a question of ligamentous injury (focal neck pain and minimal malalignment of the lateral cervical x-ray [meeting the criteria in Table 2]) and the cervical films show no evidence of instability or fracture, flexion-extension views should be obtained.17,19 These radiographs should only be obtained in conscious patients who are able to cooperate. Only active motion should be allowed, with the patient limiting the motion of the neck based on the occurrence of pain. Under no circumstance should cervical spine flexion and extension be forced, since force may result in cord injury. Although they may be considered adequate to rule out a fracture, cervical spine radiographs have limitations. 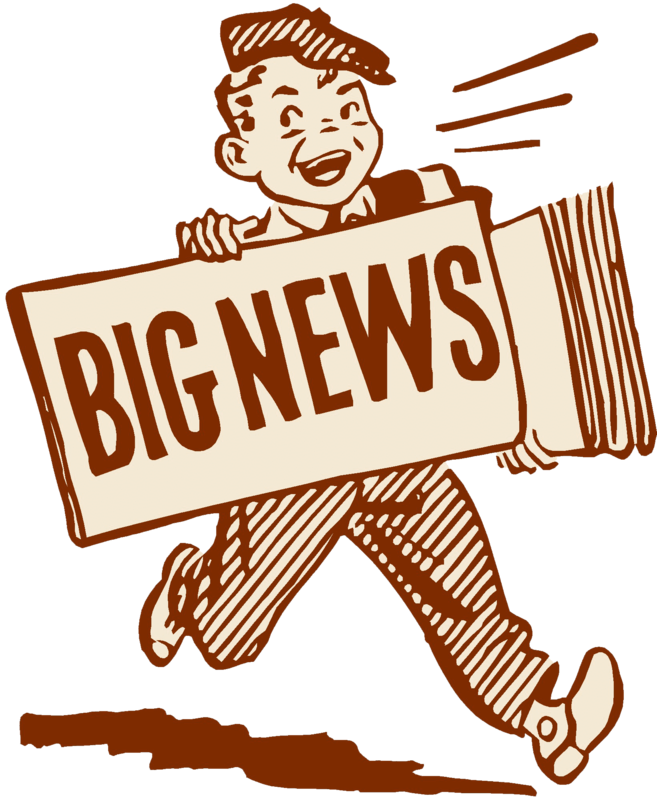 Up to 20 percent11,20,21 of fractures are missed on plain radiographs. If there is any question of an abnormality on the plain radiograph or if the patient has neck pain that seems to be disproportionate to the findings on plain films, a CT scan of the area in question should be obtained. The CT is excellent for identifying fractures, but its ability to show ligamentous injuries is limited.22 Occasionally, plain film tomography may be in order if there is a concern about a type II dens fracture (Figure 1). While some studies have used magnetic resonance imaging (MRI) as an adjunct to plain films and CT scanning,23,24 the lack of wide availability and the relatively prolonged time required for MRI scanning limits its usefulness in the acute setting. Another constraint is that resuscitation equipment with metal parts may not be able to function properly within the magnetic field generated by the MRI. 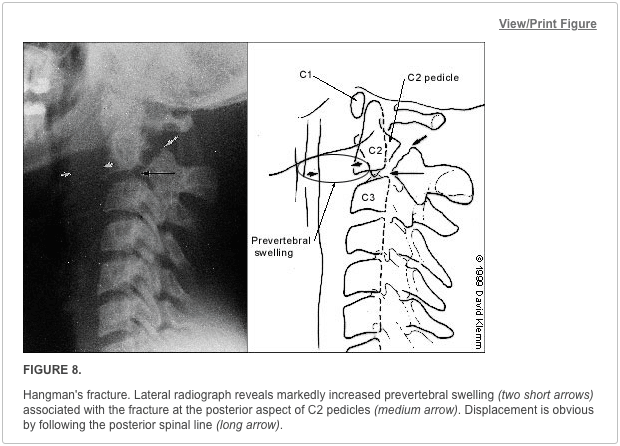 Figure 2 summarizes the approach to reading cervical spine radiographs. 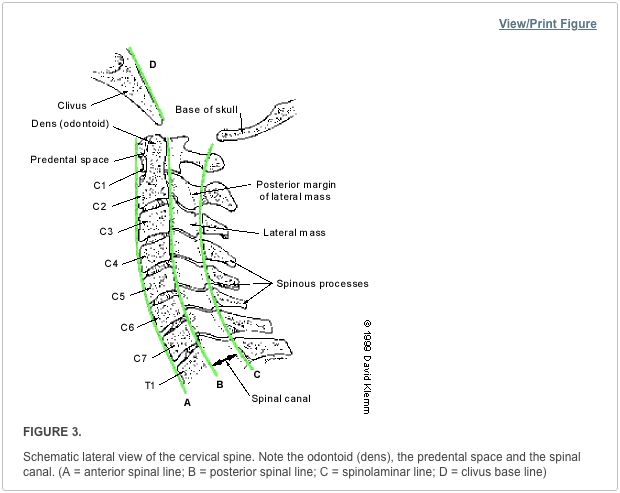 Alignment of the vertebrae on the lateral film is the first aspect to note (Figure 3). The anterior margin of the vertebral bodies, the posterior margin of the vertebral bodies, the spinolaminar line and the tips of the spinous processes (C2-C7) should all be aligned. Any malalignment (Figures 4 and 5) should be considered evidence of ligamentous injury or occult fracture, and cervical spine immobilization should be maintained until a definitive diagnosis is made. Confusion can sometimes result from pseudosubluxation, a physiologic misalignment that is due to ligamentous laxity, which can occur at the C2-C3 level and, less commonly, at the C3-C4 level. While pseudosubluxation usually occurs in children, it also may occur in adults. If the degree of subluxation is within the normal limits listed in Table 2 and the neck is not tender at that level, flexion-extension views may clarify the situation. Pseudosubluxation should disappear with an extension view. However, flexion-extension views should not be obtained until the entire cervical spine is otherwise cleared radiographically. After ensuring that the alignment is correct, the spinous processes are examined to be sure that there is no widening of the space between them. If widening is present, a ligamentous injury or fracture should be considered. In addition, if angulation is more than 11 degrees at any level of the cervical spine, a ligamentous injury or fracture should be assumed. The spinal canal (Figure 2) should be more than 13 mm wide on the lateral view. Anything less than this suggests that spinal cord compromise may be impending. Next, the predental space—the space between the odontoid process and the anterior portion of the ring of C1 (Figure 2)—is examined. This space should be less than 3 mm in adults and less than 4 mm in children (Table 2). An increase in this space is presumptive evidence of a fracture of C1 or of the odontoid process, although it may also represent ligamentous injury at this level. If a fracture is not found on plain radiographs, a CT scan should be obtained for further investigation. The bony structures of the neck should be examined, with particular attention to the vertebral bodies and spinous processes. The retropharyngeal space (Figure 2) is now examined. The classic advice is that an enlarged retropharyngeal space (Table 2) indicates a spinous fracture. However, the normal and abnormal ranges overlap significantly.25 Retropharyngeal soft tissue swelling (more than 6 mm at C2, more than 22 mm at C6) is highly specific for a fracture but is not very sensitive.26 Soft tissue swelling in symptomatic patients should be considered an indication for further radiographic evaluation. Finally, the craniocervical relationship is checked. The dens is next examined for fractures. Artifacts may give the appearance of a fracture (either longitudinal or horizontal) through the dens. These artifacts are often radiographic lines caused by the teeth overlying the dens. However, fractures of the dens are unlikely to be longitudinally oriented. If there is any question of a fracture, the view should be repeated to try to get the teeth out of the field. If it is not possible to exclude a fracture of the dens, thin-section CT scans or plain film tomography is indicated. Next, the lateral aspects of C1 are examined. These aspects should be symmetric, with an equal amount of space on each side of the dens. Any asymmetry is suggestive of a fracture. 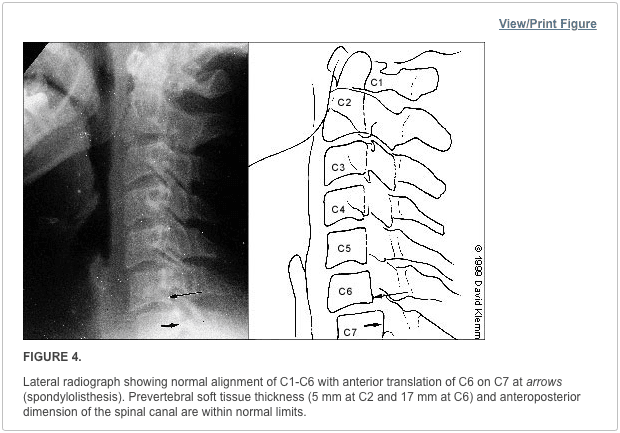 Finally, the lateral aspects of C1 should line up with the lateral aspects of C2. If they do not line up, there may be a fracture of C1. Figure 6 demonstrates asymmetry in the space between the dens and C1, as well as displacement of the lateral aspects of C1 laterally. The height of the cervical spines should be approximately equal on the anteroposterior view. The spinous processes should be in midline and in good alignment. If one of the spinous processes is off to one side, a facet dislocation may be present. The most common types of cervical abnormalities and their radiographic findings are listed in Table 3. Except for the clay shoveler’s fracture, they should be assumed to be unstable and warrant continued immobilization until definitive therapy can be arranged. Any patient found to have one spinal fracture should have an entire spine series, including views of the cervical spine, the thoracic spine and the lumbosacral spine. 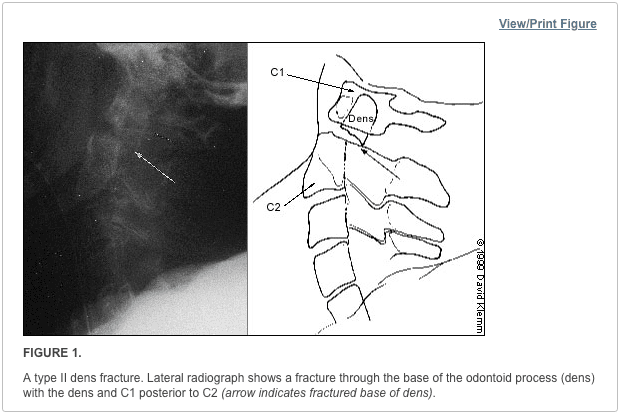 The incidence of noncontiguous spine fractures ranges up to 17 percent.27,28 Figures 7 through 9 demonstrate aspects of common cervical spine fractures. Cervical spine radiographs include three standard views, such as the coned odontoid peg view, the anteroposterior view of the entire cervical spine, and the lateral view of the entire cervical spine. Most qualified and experienced healthcare professionals, including chiropractors, offer additional views to visualize the cervicothoracic junction as well as to evaluate the proper alignment of the spine in all patients. MARK A. GRABER, M.D., is associate professor of clinical family medicine and surgery (emergency medicine) at the University of Iowa Hospitals and Clinics, Iowa City. 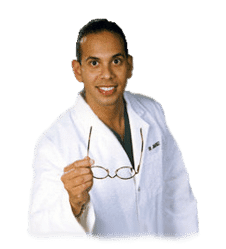 He received his medical degree from Eastern Virginia Medical School, Norfolk, and served a residency in family medicine at the University of Iowa College of Medicine, Iowa City. MARY KATHOL, M.D., is associate professor of radiology at the University of Iowa Hospitals and Clinics. She is also head of the musculoskeletal radiology section. She received her medical degree from the University of Kansas School of Medicine, Kansas City, Kan., and served a residency in radiology at the University of Iowa College of Medicine. Address correspondence to Mark A. Graber, M.D., Department of Family Medicine, Steindler Bldg., University of Iowa Hospitals and Clinics, Iowa City, Iowa 52242. Reprints are not available from the authors. In conclusion, it is essential to evaluate all views of the cervical spine through imaging diagnostic assessments. While cervical spine radiographs can reveal injuries and conditions, not all neck injuries are detected through radiography. Computed tomography, or CT, scans of the cervical spine are highly accurate in the diagnosis of neck fractures which can help with treatment. The scope of our information is limited to chiropractic as well as to spinal injuries and conditions. To discuss the subject matter, please feel free to ask Dr. Jimenez or contact us at 915-850-0900 . 1. Kreipke DL, Gillespie KR, McCarthy MC, Mail JT, Lappas JC, Broadie TA. 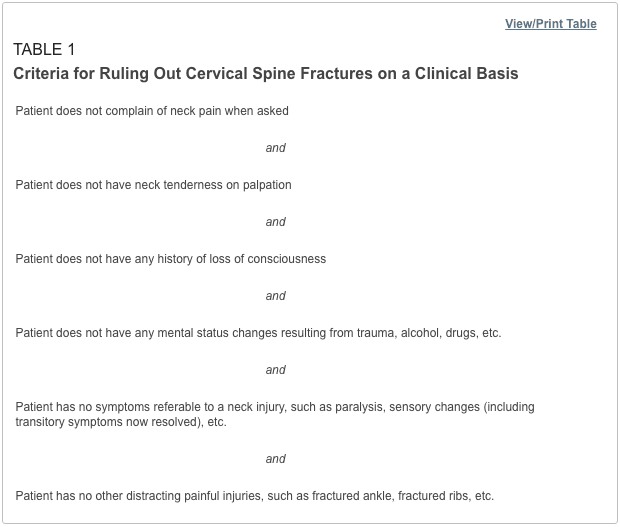 Reliability of indications for cervical spine films in trauma patients. J Trauma. 1989;29:1438–9. 2. Ringenberg BJ, Fisher AK, Urdaneta LF, Midthun MA. Rational ordering of cervical spine radiographs following trauma. Ann Emerg Med. 1988;17:792–6. 3. Bachulis BL, Long WB, Hynes GD, Johnson MC. Clinical indications for cervical spine radiographs in the traumatized patient. Am J Surg. 1987;153:473–8. 4. Hoffman JR, Schriger DL, Mower W, Luo JS, Zucker M. Low-risk criteria for cervical-spine radiography in blunt trauma: a prospective study. Ann Emerg Med. 1992;21:1454–60. 5. Saddison D, Vanek VW, Racanelli JL. Clinical indications for cervical spine radiographs in alert trauma patients. Am Surg. 1991;57:366–9. 6. Kathol MH, El-Khoury GY. 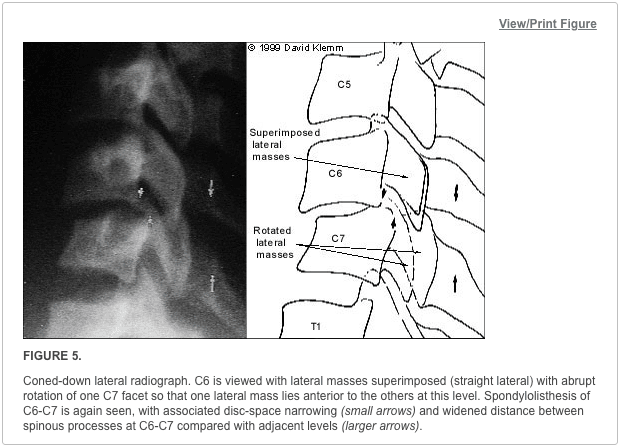 Diagnostic imaging of cervical spine injuries. Seminars in Spine Surgery. 1996;8(1):2–18. 7. Lally KP, Senac M, Hardin WD Jr, Haftel A, Kaehler M, Mahour GH. Utility of the cervical spine radiograph in pediatric trauma. Am J Surg. 1989;158:540–1. 8. Rachesky I, Boyce WT, Duncan B, Bjelland J, Sibley B. 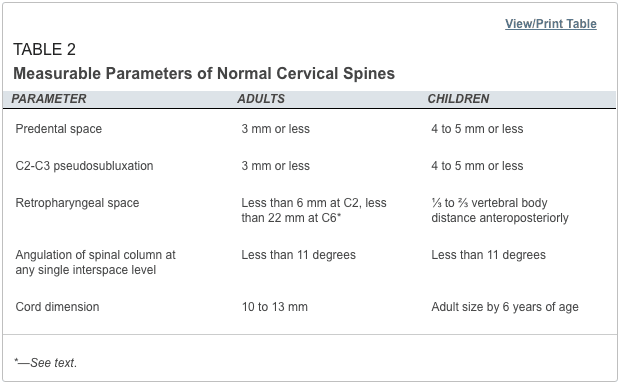 Clinical prediction of cervical spine injuries in children. Radiographic abnormalities. Am J Dis Child. 1987;141:199–201. 9. Laham JL, Cotcamp DH, Gibbons PA, Kahana MD, Crone KR. 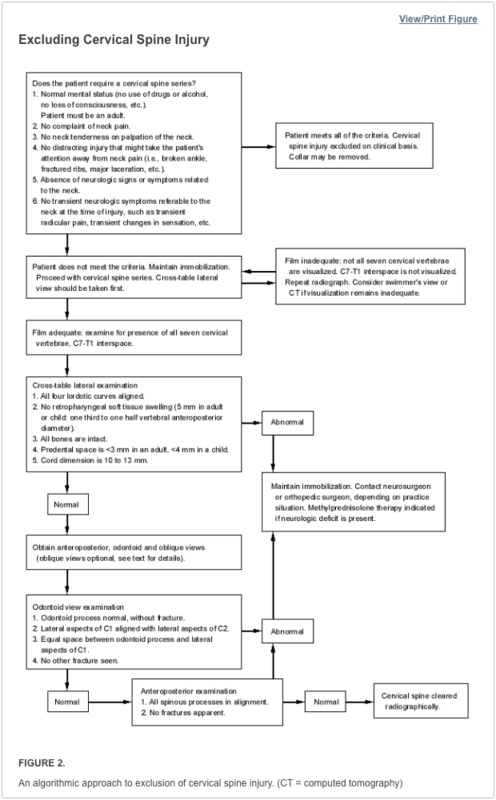 Isolated head injuries versus multiple trauma in pediatric patients: do the same indications for cervical spine evaluation apply? Pediatr Neurosurg. 1994;21:221–6. 10. McKee TR, Tinkoff G, Rhodes M. Asymptomatic occult cervical spine fracture: case report and review of the literature. J Trauma. 1990;30:623–6. 11. Woodring JH, Lee C. Limitations of cervical radiography in the evaluation of acute cervical trauma. J Trauma. 1993;34:32–9. 12. Spain DA, Trooskin SZ, Flancbaum L, Boyarsky AH, Nosher JL. The adequacy and cost effectiveness of routine resuscitation-area cervical-spine radiographs. Ann Emerg Med. 1990;19:276–8. 13. Tintinalli JE, Ruiz E, Krome RL, ed. Emergency medicine: a comprehensive study guide. 4th ed. New York: McGraw-Hill, 1996. 14. Gerrelts BD, Petersen EU, Mabry J, Petersen SR. Delayed diagnosis of cervical spine injuries. J Trauma. 1991;31:1622–6. 15. Davis JW, Phreaner DL, Hoyt DB, Mackersie RC. The etiology of missed cervical spine injuries. J Trauma. 1993;34:342–6. 16. Apple JS, Kirks DR, Merten DF, Martinez S. Cervical spine fractures and dislocations in children. Pediatr Radiol. 1987;17:45–9. 17. Turetsky DB, Vines FS, Clayman DA, Northup HM. Technique and use of supine oblique views in acute cervical spine trauma. Ann Emerg Med. 1993;22:685–9. 18. Freemyer B, Knopp R, Piche J, Wales L, Williams J. Comparison of five-view and three-view cervical spine series in the evaluation of patients with cervical trauma. Ann Emerg Med. 1989;18:818–21. 19. Lewis LM, Docherty M, Ruoff BE, Fortney JP, Keltner RA Jr, Britton P. Flexion-extension views in the evaluation of cervical-spine injuries. Ann Emerg Med. 1991;20:117–21. 20. Mace SE. Emergency evaluation of cervical spine injuries: CT versus plain radiographs. Ann Emerg Med. 1985;14:973–5. 21. Kirshenbaum KJ, Nadimpalli SR, Fantus R, Cavallino RP. Unsuspected upper cervical spine fractures associated with significant head trauma: role of CT. J Emerg Med. 1990;8:183–98. 22. Woodring JH, Lee C. The role and limitations of computed tomographic scanning in the evaluation of cervical trauma. J Trauma. 1992;33:698–708. 23. Schaefer DM, Flanders A, Northrup BE, Doan HT, Osterholm JL. Magnetic resonance imaging of acute cervical spine trauma. Correlation with severity of neurologic injury. Spine. 1989;14:1090–5. 24. Levitt MA, Flanders AE. Diagnostic capabilities of magnetic resonance imaging and computed tomography in acute cervical spinal column injury. Am J Emerg Med. 1991;9:131–5. 25. Templeton PA, Young JW, Mirvis SE, Buddemeyer EU. The value of retropharyngeal soft tissue measurements in trauma of the adult cervical spine. Cervical spine soft tissue measurements. Skeletal Radiol. 1987;16:98–104. 26. DeBehnke DJ, Havel CJ. Utility of prevertebral soft tissue measurements in identifying patients with cervical spine fractures. Ann Emerg Med. 1994;24:1119–24. 27. Powell JN, Waddell JP, Tucker WS, Transfeldt EE. Multiple-level noncontiguous spinal fractures. J Trauma. 1989;29:1146–50. 28. Keenen TL, Antony J, Benson DR. Non-contiguous spinal fractures. J Trauma. 1990;30:489–91. 29. Bracken MB, Shepard MJ, Collins WF Jr, Holford TR, Baskin DS, Eisenberg HM, et al. Methylprednisolone or naloxone treatment after acute spinal cord injury: 1-year follow-up data. Results of the second National Acute Spinal Cord Injury Study. J Neurosurg. 1992;76:23–31. 30. Galandiuk S, Raque G, Appel S, Polk HC Jr. The two-edged sword of large-dose steroids for spinal cord trauma. Ann Surg. 1993;218:419–25. 31. Grabb PA, Pang D. Magnetic resonance imaging in the evaluation of spinal cord injury without radiographic abnormality in children. Neurosurgery. 1994;35:406–14. 32. Pang D, Pollack IF. Spinal cord injury without radiographic abnormality in children—the SCIWORA syndrome. J Trauma. 1989;29:654–64. 33. Hadley MN, Zabramski JM, Browner CM, Rekate H, Sonntag VK. Pediatric spinal trauma. Review of 122 cases of spinal cord and vertebral column injuries. J Neurosurg. 1988;68:18–24. 34. Kriss VM, Kriss TC. SCIWORA (spinal cord injury without radiographic abnormality) in infants and children. Clin Pediatr. 1996;35:119–24. Coordinators of this series are Thomas J. Barloon, M.D., associate professor of radiology and George R. Bergus, M.D., assistant professor of family practice, both at the University of Iowa College of Medicine, Iowa City.